1. The Rib Check: This physical check is one of the most reliable because the fur makes visual methods a little more difficult. Place your thumbs on your cat’s backbone with your hands on her rib cage. You should be able to feel her ribs easily without excess padding between the skin and the ribs. 2. The Overhead Check: Look at your cat from above. Her waste shouldn’t extend too far out beyond her ribs. Of course, breeds all differ in stature and no two cats are the same. 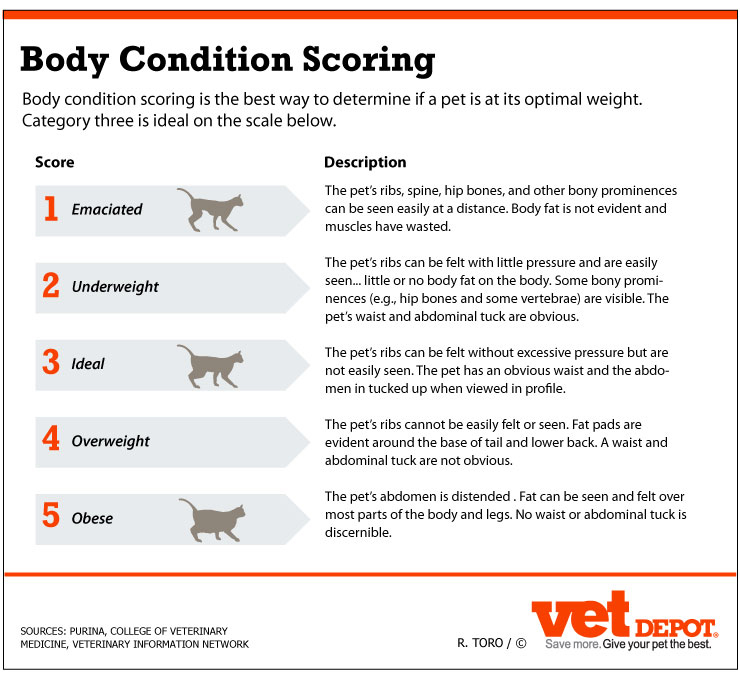 Consult with a veterinarian to determine if your feline companion is overweight. Extra weight can be remedied with the right portions of a healthy cat food and plenty of exercise. Bananas may not seem like a likely choice when it comes to choosing a treat for your dog, but there are actually quite a few health benefits to sharing a little of that yummy yellow fruit with Fido. For both humans and dogs alike, bananas are a great source of potassium, magnesium, vitamin C, vitamin B6, fiber, biotin, and copper. Bananas help boost the immune system, replenish electrolytes, and promote skin and coat health. In moderation, bananas can make a healthy, low-calorie treat for dogs. Too much of anything can be a bad thing. Since bananas are high in natural sugar, dogs should only eat them as a treat, not as part of their regular diet. Excess banana consumption can lead to constipation in dogs. Also, dogs should never be fed the peel, which can cause a serious blockage. Do Dogs Even Like Bananas? The simplest answer is that some dogs do and some dogs don’t. Start off with just a little bite to test how your dog reacts. Try a swipe of peanut butter on top for an extra-special canine snack. Remember, you should always discuss any questions or concerns about your dog’s diet and nutritional requirements with a veterinarian. A tired dog is usually a happy dog, and one that’s less likely to chew up your shoes or bark at the mailman. A lot of owners don’t realize that a stroll around the block isn’t enough physical stimulation to ward of problem behavior. A run, an afternoon at doggy daycare, or a game of fetch is necessary for many dogs to get the proper amount of exercise. Speak with your vet about the right amount of physical activity for your individual dog. Just as crucial as physical activity, dogs need mental activity to keep them at their best behavior. Work on some training or try a food puzzle toy to ensure balanced mental health and help deter unwanted behavior. If your dog starts displaying an uncharacteristic problem behavior, like aggression or using the bathroom indoors, it’s very possible that a health issue could be to blame. Any painful condition, from arthritis to an ear infection, can cause a dog to act out aggressively. A urinary tract infection could be the culprit for your dog’s sudden inability to hold it while you’re away. Be sure to discuss any sudden changes in behavior with your vet to rule out possible health issues. If you let your dog jump up on you in your everyday clothes, but scold him when you’re dressed up, this sends an unclear message. Inconsistency can also come in the form of everyone in the household not being on the same page about the rules. To ensure inconstancy doesn’t hinder your pup’s good behavior, work on training on a regular basis and be sure that the whole family is in agreement about expectations. Not having enough experience with other people, animals, and experiences outside of the home can result in fearful or aggressive behavior. Puppies should be exposed to a variety of experiences at a young age to develop healthy social skills. If you’re adopting an adult dog, speak with the shelter staff to determine what kind of training and exposure is recommended (many adoptable dogs have great social skills, while other may need a little work). Changes in routine can cause canine stress, which can lead to undesirable behaviors as a coping mechanism. Whenever something major happens in your household, whether it be a new four-legged addition or a move, keep your pet’s wellbeing in mind. Stick to your dog’s regular feeding and walking routine, offer comfort items like toys and a soft bed, and be sure to spend a lot of quality time together to help combat anxiety. Although proper training and socialization can help curb some genetic traits, some breeds are just more prone to certain behaviors than others. For example, terriers are more likely to try to chase that neighborhood cat because of their prey instinct, and hounds are likely to express themselves by howling. While these aren’t necessarily negatives and training can definitely help, potential owners should do their research about a breed’s behavior quirks before bringing a new pet home. Here is a Pumpkin Recipe that is healthy for them. The early cold snaps of the past few weeks should serve as a reminder to pet owners that special precautions should be made for health and welfare of their dogs and cats as winter gets under way. Dr. Donna Alexander, Administrator of the Cook County Department of Animal and Rabies Control, offered a number of tips for pet owners to keep in mind during winter and the upcoming holidays. Bring all pets indoors. All dogs and cats, whether acclimated to outdoor living, must be brought indoors during sub-zero weather. Even creatures of the wild seek shelter when temperatures plummet. As the responsible caregiver of a pet, you should provide an indoor heated shelter for your animal. Despite their abundance of hair, all domesticated dogs and cats are subject to frostbite and hypothermia. Salt and ice. Both salt and ice can irritate your dog’s footpads. If your dog will tolerate them, foot coverings are advised. If your dog will not tolerate foot coverings, avoid the salt when possible and wash their paws with warm water when you return home. Walking the dog in the snow as opposed to the salted sidewalk may be advisable, but in extreme low temperatures this could add to frostbite concerns. Frostbite. Dogs and cats may have fur coats but they also have exposed areas that are susceptible to frostbite. Limit their time outdoors for waste elimination only. Walks should not exceed 10 minutes in sub-zero temperatures. Check their pads when you get home and wash with warm (not hot) moist towels. If you suspect frostbite on any extremity (don’t forget the nose or the tips of the ears) contact your veterinarian. Properly secure potentially poisonous material, such as antifreeze. Antifreeze is extremely toxic to all living creatures. It is sweet to the taste but even a drop can be lethal. Keep antifreeze bottles out of the reach of animals and clean up all antifreeze spills immediately. Feral cats and wild animals will seek refuge and warmth wherever they can, Dr. Alexander said. A car’s engine, for example, may provide a warm spot to “hole up” in sub-zero conditions. Dr. Alexander also reminded pet owners that they should have an established doctor-patient-client relationship with a veterinarian close to home and establish an emergency protocol. No treats from the table: There are many food items consumed by humans that may prove toxic to animals. No chocolate, stuffing containing sage, grapes or raisins should be given to any pets. Keep Christmas decorations safe: Tinsel and poinsettias can be toxic. If you are able, elevate your Christmas decorations above the grasp of your pet. Better yet, surround your tree with animal barricade such as child-proof fencing. Provide a safe haven for pets: Create a quiet spot for your pets where they can get away from the seasonal merriment. Acclimate them to their safe haven by placing familiar smells (blankets, pillows) or toys in the area you have designated. When guests arrive, make sure they are aware that this “pet secure” area should not be disturbed. Display rabies tags on collars and secure egress: Dogs and cats can become bewildered by the increase number of holiday guests and often try to escape. Remind your guests to close doors when entering or leaving and to secure gates. Make sure that your animal is wearing identification in case of escape. Planning On Bringing a New Dog Home? Or perhaps you’ve already brought a new dog home and are having problems? There are several things to consider when bringing a new dog home and I’m here to tell you about a way you can make adjusting easier. Stacie Sparks is the person I originally heard about the “Two Week Shutdown” from and she deserves much of the credit for our promoting this method. It WORKS and it’s something everyone needs to keep in mind, especially those with multi-dog homes. What IS the Two Week Shutdown? Your new dog needs time to adjust and there are many scenarios that people put their new dog through that only encourage negative behaviors to surface. Dogs may be resilient creatures, but they do also need to know that we are in control of situations, that we will protect and provide for them, and give them clear expectations and routines to follow. Two weeks is just a guideline. Most dogs advance faster but depending on the individual dog and how closely you follow the guidelines, it may take longer. The Items You’ll Need for Success! – Read the item descriptions on WHY you need these! This will be your dog’s safe zone; the place your dog can retreat to when they need quiet time. You can find these in different lengths but 20 ft is pretty standard and really helps you to let the dog run about while still maintaining control. These food rolls make EXCELLENT training treats! You can cut up the rolls into slices or into little pieces – any size you want! They’re also quick to consume for the dog and a good, QUALITY item to feed your pooch! What Does The Two Week Shutdown Mean To Me? When you bring home a new dog, young or old, we KNOW you are so excited and you want to share your new addition with everyone you can! Did you know that by taking your dog to pet stores, friends and families homes, dog parks, pet events, or other really busy, social settings, you may inadvertently be telling your dog to act out? Think about this: the majority of us when put into new situations do not put all of ourselves out there. We put forth what we want people to see or think they want to see. Also, we are much more likely to withdraw from situations that make us uncomfortable. What would you do if you were on a date with someone new and they took you to meet their family who constantly hugged you, kissed you, or otherwise invaded your space? What would you do if they then took you to meet all their friends and they did the same? Would you consider your date sane? Would you consider your date someone you could trust? Sure, you liked them initially to go out with them on a first date, but wouldn’t their actions throughout that first date dictate whether you would see them again? Would you see them again if they put you in so many situations that made you uncomfortable? Consider this as well; say you had to go live with a new family who spoke a language you didn’t understand. You’ll be reserved, perhaps a bit detached. What if they doted on you, as a new family member, speaking to you in a language you don’t understand, expecting you to interact with all their family members and friends? Would you feel comfortable? Would you want to retreat to a safe place? Would you know where a safe place was? Would they give you one? Things many people forget is that we expect our new dogs to be so accepting of everything and we put them in these very similar situations and then become alarmed when they “act out.” Your new dog is acting out or misbehaving because they don’t view you as the decision maker. Remember, to them, you are putting them in situations that make them feel uncomfortable. Keep reading to find out how to help your dog adjust and begin to view you as the decision maker of the home and to help them put their trust in YOU, where it belongs! Even if you’ve had your dog a few days and are beginning to notice some issues behaviorally, you can still start fresh and get them started on the shutdown. A tired dog is a happy dog! Exercising your dog(s) regularly and thoroughly will help ensure they relax into their new household a little easier. Without that pent up energy, they’ve GOT to relax! However! 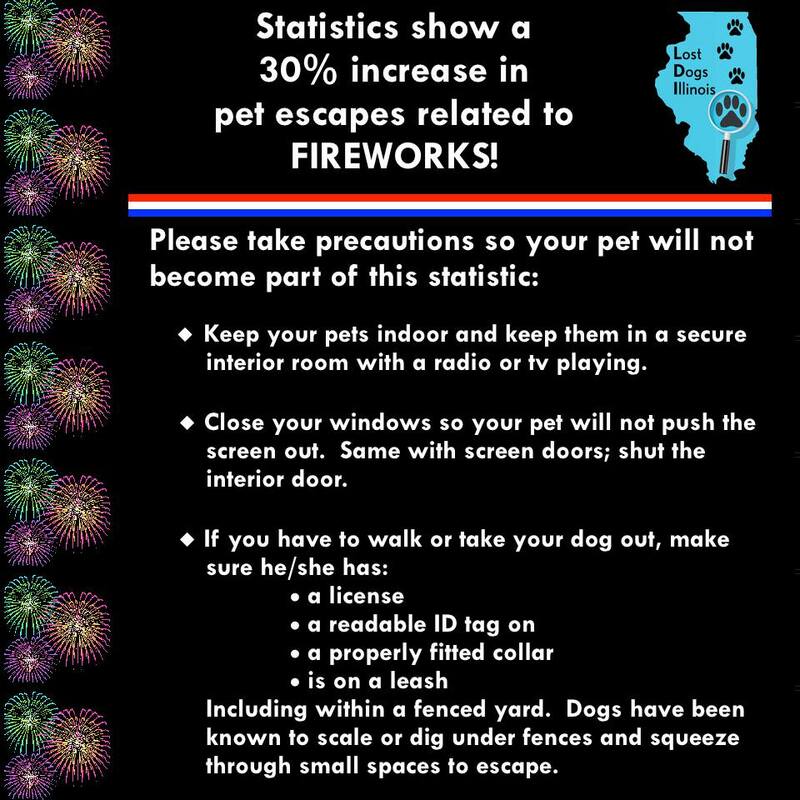 Do not take them to pet stores, dog parks, other people’s homes, etc. Again, these situations provide an overabundance of stimulation that your dog needs to have the trust built in you for YOU to handle the situation so they don’t have to. Keep them leashed to you at ALL times when they are not crated. Yes, even in the house and yes, even if you have a fully fenced yard. Why? It builds the precedence with them that YOU are the bringer of everything in life. Additionally, keeping them leashed to you keeps them from getting in trouble. If they aren’t housetrained, they can’t very well go run out of your line of sight and have an “accident” if you have them leashed to you huh? Or, if someone new comes in the home, keeping them leashed to you can help prevent them reinforcing undesirable behaviors like jumping on people. When the dog is leashed to you, YOU are in control. The dog WILL begin to understand this. Do not allow your new dog and your existing pets into a 24/7 free for all. Remember, your existing pets don’t know this new “intruder” and the new dog doesn’t know the routine of the home and what’s permissible. Setting a routine with the new dog first, without the full distraction of other pets will make life 1000 times easier when you begin integrating them. When bringing your new dog home, give them a brief tour of their primary living area or the places they will be most often. Now, it’s crate time! It’s time to give the dog some time to itself to take in everything that’s happened thus far. The crate will be used as a tool in the shutdown, not as a prison. Think of it more like their safe place. Sure, some may cry initially but with positive reinforcement (yummy crate-only treats, no coddling, etc.) they’ll learn to accept their time alone and realize, it’s not so bad! Something to remember is to NOT let the dog out of the crate while they are crying. Do NOT give in as this will only serve to reinforce their crying and barking to be let out of the crate. Being inconsistent will likely train your dog to be a screamer in the crate and that’s not what you want at all! Special considerations should be given to dogs with Separation Anxiety. Read more about it here! Initially, keep out of crate interactions short, just like time in the crate should be short. 20-30 minutes at a time initially will help keep interactions with you positive and help reinforce positive crate training. You will increase the time as needed as the days move forward. Little by little. You are using the crate as a way to give them a time out to collect their thoughts and to process the new information they received in their interactions with you. If this is a new and only dog, you’ll likely find that progress will move swiftly! No worries! Patience is a virtue and you will be handsomely rewarded! For more information on integrating your new dog with existing pets, keep reading! Take things SLOW and easy! When bringing home a new dog to a home with existing pets, its important to realize that everyone in the household will need time to adjust to the new living arrangements and routine. It’s important to take things very slow initially and keep things positive and upbeat. First, let me go ahead and say that the initial meeting of the new dog with resident dog(s) needs to happen OFF your property in a quiet, neutral setting. We don’t need your resident dogs to feel the need to “protect what is theirs” without having the opportunity to get to know one another first. Now, after the initial meeting if things go well and you choose to bring the new dog home (or this can be tweaked if you’ve already introduced some other way that wasn’t recommended here), it’s time to crate and rotate initially. I’d say for at least the first 48 hours, keep the new dog and your existing pets separated. Sure, let them sniff around. Shoot, crate them side by side (never nose to nose!) to help them get used to the other being around. But, keep at least the first 2 days for yourselves and don’t expect the new dog and existing dogs to interact and everything be hunky dory. After the initial time has passed, do another outdoors meeting on leash first, then bring them indoors and let them further interact. KEEP LEASHES ON. This is just in case something unexpected DOES happen. You’ve got leashes on to help keep things under control. It can also help when you interject a too hyper play session to encourage the dogs to settle and relax. Keep new interactions VERY short initially. I’m talking 10-15 minutes. End things on a positive note and give the dogs time to process everything that happened. Doing things this way does a couple of things. It gives the dogs the opportunity to enjoy one another’s company without becoming overstimulated and it also gives them the desire to want MORE interaction. Sure, you might have to deal with a bit more whining from them because they want to play, but remember, YOU call the shots. Not them. Being very deliberate in the amount of time they have to play together and WHEN they get to play together sets that precedence of YOU being the person they look to for direction. And with multiple dogs, that’s what you WANT! Make sure to monitor toys. Actually, at the very beginning of interactions, I recommend not having any toys at all for them to play with. Let the dogs learn one another first before introducing things which may be of high value to one or all. Give them the chance to realize one another’s signals for play and for agitation. It is also YOUR responsibility to learn these things as well. As they say, an ounce of prevention is worth a pound of cure! Deja was my first dog. I adopted her in October of 2005. We stayed a single dog home until March of 2007 when I decided I was ready for another one. Anywho, I’d say within about 3 days, our first issue arose. Cyrus snapped at Deja over a toy. Poor Deja was SO offended and concerned that for the rest of the night she came and sat down by me. I’d picked up all the toys and began searching the internet for some immediate ideas I could put into play with the situation that was going on. Something I feel I should let you guys know, I’m a savvy ‘net searcher and a frequent forum user. 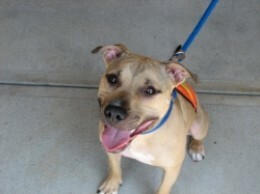 I’d joined Pit Bull Forum a few months prior and went there to explain my issues. This is where Stacie came into play and laid it down for me HARD. She point blank told me that I was moving entirely too fast and that I needed to separate the dogs and move VERY slowly. Honestly, at the time, none of that made sense to me. Cyrus was such a laid back and chilled out kinda guy that I didn’t see why I needed to make those changes. I asked a few more questions and explained the dogs a little more and again was told that none of that mattered, I was moving too fast and that’s what the problem was. I was skeptical at first but you know what? I had NOTHING to lose by trying it out. Well, except a dog I had just adopted and had started bonding with deeply. The dogs immediately went on a crate and rotate schedule. What this means is that they did NOT interact with one another at all and only saw each other in passing as they were being crated and taken out individually. One crate was set up on one side of my bed and the other crate set up on the other side of the bed. I kept them separated like this for about one week. I kept each dog out for an hour at a time when I was home. I also had to work with Cyrus on his “crate issues” because he would SCREAM in his crate. Initially, I’d have to wait an hour after getting home to even remotely venture upstairs to get him to start reinforcing the “I’ll let you out when you’re quiet” routine. I thank doG Deja was so wonderful during this because she got the “short end of the stick” in waiting while he was worked with. When we were ready to reintroduce the dogs, we took them outside for a sniff first and then brought them back in to play. We kept both dogs leashed at first and then eventually took them off when letting them play. They got about 10-15 minutes of time together then I stepped in, leashed one and took that one up stairs to be crated for quiet time and to give the other dog some one on one attention. Over the next couple of weeks, their time out together supervised was extended. It was a slow process that WORKED. It may have taken time, however, it set the precedence of who was who in the home and what was expected of them. It was at least a month before I reintroduced toys and at the first sign of any attitude, I stepped in and took them all away. Now, years later, they are out together when I’m home. They can have toys out and play quite well with them. The difference from then to now is REMARKABLE and so worth mentioning. Cyrus took a couple of months of conditioning with the crate but he no longer throws fits and waits quietly for the most part. Slowing things down and setting a solid routine helped tremendously. It helped him learn who makes the decisions and it helped build the relationship between him and Deja. It helped KEEP him in his new home as it likely would have gotten out of control if I hadn’t been proactive and stepped in. It may sound like tough work, but it’s worth it! Keeps pets comfortable and dry off the cold, hard floor. Easy to keep clean and odor free. Top choice of kennels and shelters worldwide. What does “Guaranteed Chew proof” mean? What is Kuranda’s return / exchange policy? What kind of fabrics are available for Kuranda dog beds? Do Kuranda beds support Extra Large and Giant Breed Dogs? Can I adjust the height of a Kuranda dog bed? Can I use a Kuranda dog bed outdoors? What health benefits does the Kuranda dog bed offer over other dog beds? How do Kuranda dog beds compare to other cot-style dog beds? What do professionals have to say about Kuranda Dog Beds? Where can I download assembly instructions for my bed? How do Kuranda dog beds compare to pillow-style dog beds? Are Kuranda Slipcovers and Fleece Pads machine-washable? Can Kuranda ship to my country? How much will it cost to ship my Kuranda bed? 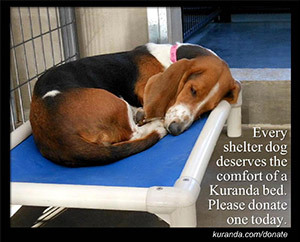 But you can make a world of difference in a homeless pet’s life by donating a Kuranda crate bed to our rescue. Special donation discount. 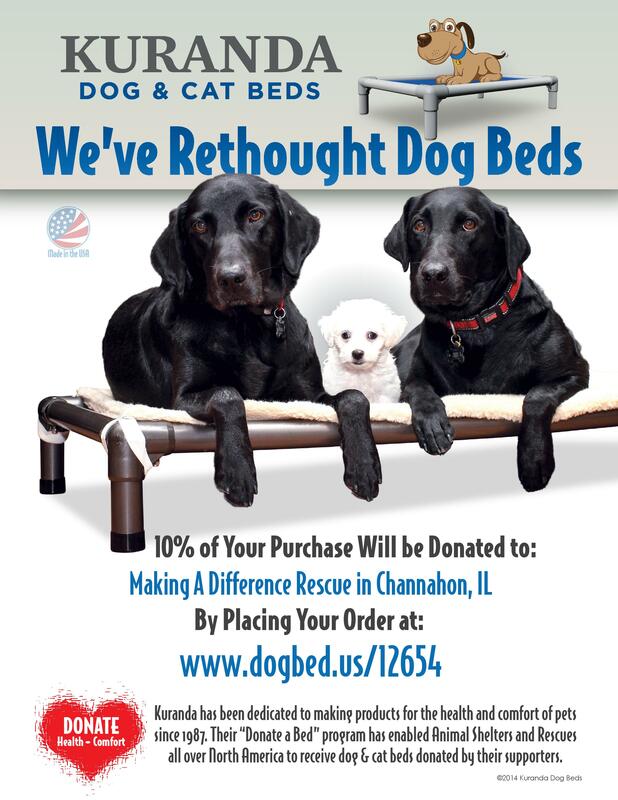 Beds ship directly to our rescue headquarters. 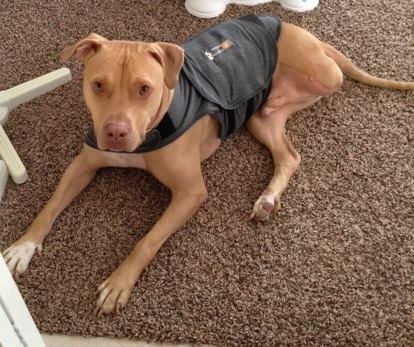 We wanted to thank Macho’s family, the Sweeney’s, for sending Duke a much needed thundershirt. Thundershirts help dogs and cats with some anxiety in the same way that swaddling offers comfort to human babies. This Dog Food Calculator can help you estimate the proper serving size for your pet. It’s based upon a scientific study1 published by a respected veterinary research institute. Please click here to use the calculator. The Dog Food Calculator was designed to be used for adult dogs only — not for puppies. And it should never be used for pregnant or lactating females. Small to medium breeds may be considered adults after about six months of age. Older dogs have significantly lower energy needs than younger ones. So, it’s easy for them to put on extra weight. Once you’ve entered your dog’s ideal weight and activity level, you’ll know the number of calories per day. However, to convert calories into something you can use, you’ll need to enter the number of calories in your dog’s food. Since each dog has its own unique energy needs, it’s impossible to accurately predict the exact serving size that’s right for your pet. So, start with the package’s feeding instructions — or the amount suggested by our calculator. And be sure to weigh your dog every few weeks.